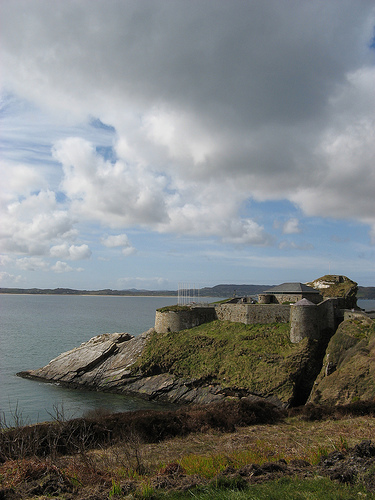 Dunree Fort, Lough Swilly. Lord Cavan tested a 50 pounder here in 1797 before the fort was built. It was able to strike the cliffs of Knockalla. A French invasion of 10,000 was expected in Lough Swilly by Rev. Chichester and the townspeople of Buncrana. Wolfe Tone would fall victim to these schemes. Arthur arrived a few days ago. Nothing has been arranged as yet in a satisfactory manner for him. A variety of things is proposed to him but no vigorous steps taken to procure them. It is proposed to him to get Mr. Banks the weight master of Belfast to resign his employment on condition of arthritis and giving him the income during his life but this I fear he will not consent to. Sir Charles Talbot talks of giving the Inishowen agency to him if he can dispose of Harry Alexander by any means and get a good security. The prospect of a seat in parliament is all over and I believe they have devised schemes for him which they know to be impracticable. However notwithstanding all this he is sanguine in his expectations of something being done for him. He has yet £250 in my Uncle Hart’s hands with which he means to be called to the bar and pursue his profession for a year at all accounts. I am very much rejoiced at my uncle’s offer of selling you his part of Doe. I am convinced his absence from his wife made at least a temporary change in his disposition for on his return to Dublin, I have heard him talk of you in a manner more affectionate than I thought he was capable of to any of his relations and I am convinced that at that time he had the sentiments of a brother towards you. I also found that his manners towards his wife were more civil than usual. There has been no disturbance in this country since you left us except for the burning of Capt. Smyth’s cattle at Rathmullan for which ten men have been committed to jail. A yeoman was murdered near Belfast last week and another robbed of his arms. There is a party of Dragoons arrived in Clonamny to give immediate intelligence of an enemy and fleet should it be seen off Dunaff. Editor’s notes – Both Lord Cavan and Admiral Gardiner would be involved in the capture and arrest of Wolfe Tone a few months later. The extent to Rev. Ed Chichester’s knowledge of military affairs is astonishing. This entry was posted in Uncategorized and tagged politics, society, vacation by admin. Bookmark the permalink. Poor Wolfe Tone another victim of imperialism.However you can kill the man but you can never kill his dream.As history has proved.